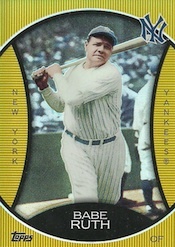 2010 Topps Series 1 Baseball is the first Topps baseball product following the exclusive agreement between Topps and Major League Baseball. 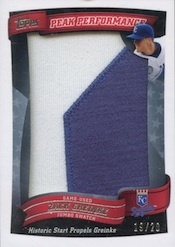 It features updated logos noting it as the exclusive trading card of the MLB, as well as a new streamlined rookie card logo. 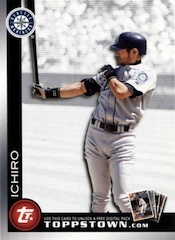 2010 Topps Series 1 starts with a 330-card base set, and includes several subsets, such as League Leaders, Award Winners, Classic Combos, Teams and Franchises. Adding to the base set, Gold #/2010, Black Border #/59 (Hobby/Jumbo), Platinum 1/1 and Printing Plates 1/1 (Hobby/Jumbo). All-Black (Wal-Mart packs), and Throwback (Target packs) are retail-exclusive parallels. Framed Silk Collection cards are numbered to 50 and found only in Hobby or Jumbo boxes. 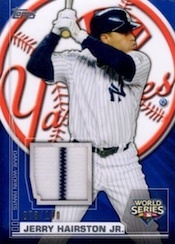 The 2009 World Series Champion New York Yankees are the focus of several insert sets, including World Series Relics (#/100), World Series Autographs (#/50) and World Series Autographed Relics (#/50 -Hobby/Jumbo). Hat Logos are a new addition and feature a complete hat logo patch and are numbered to 99. The manufactured relic cards fall one per Hobby case or one per Jumbo box. 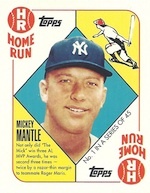 1961 Mickey Mantle Reprint cards are numbered to 61 and include a game-used relic piece. 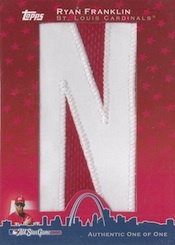 In The Name Relics are a Hobby/Jumbo-exclusive and include the individual letters from the 2009 All-Star Game work-out jerseys. All cards are numbered one-of-one for each letter of the player's last name. Baseball Legends Cut Signatures offers a handful of one-of-one cut signature cards. 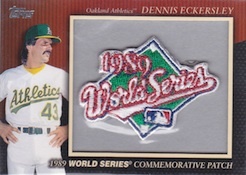 MLB Exclusive Patch Program cards celebrate the new agreement. 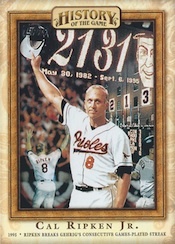 The Topps Chrome-themed set includes a total of 100 manufactured logoman patch cards spread throughout the 2010 Topps product line. 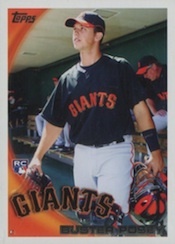 The first ten cards are found in 2010 Topps Series 1 and are numbered to 50. 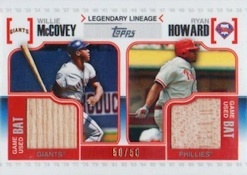 Turkey Red cards also appear across the Topps line in 2010 and start with a 50-card set in Series 1. 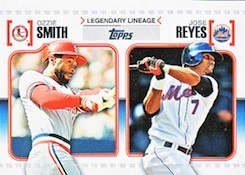 Legendary Lineage and Legendary Lineage Relics (#/50) take a past and present look at the stars of baseball, combining two players on the same card. Sketch Cards are one-of-one art cards found only in Hobby or Jumbo boxes. Hall of Fame Buybacks are also found exclusively in Hobby or Jumbo boxes. 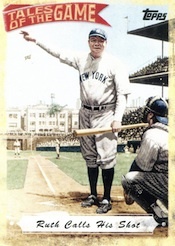 Several inserts take a look at the history of Topps. The Cards Your Mother Threw Out includes a reprinted card from each year of the Topps history. There is also an Original Back parallel. Similarly, The History of the Game and Tales of the Game, note significant events, locations and moments in baseball and Topps history. When They Were Young showcases current stars during their Little League, high school or college days. Marking some of the greatest moments for top current and former players, Peak Performance inserts total 50 cards. Also, Peak Performance Relics, Peak Performance Jumbo Relics (#/20, Hobby/Jumbo), Peak Performance Autographs, and Peak Performance Autographed Relics (Hobby/Jumbo), add multiple hit options. Unannounced variations and short prints provide a chase for collectors and include a variety of themes. 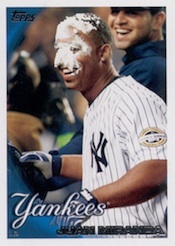 Pie in the Face variations document the classic baseball celebration in all its glory. Abe Lincoln variations sneak an image of the former president into several cards. Lastly, Uniform variations use computer magic to update jerseys for new team additions. 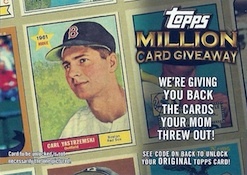 The Topp Million Card Giveaway promotion offers exclusive online cards and a variety of prizes. The Million Card Giveaway Code cards are found 1:6 packs, and offer chance to unlock original vintage Topps cards and every card is a winner. At one per pack. Ticket to Toppstown cards include star player offer codes to be entered on toppstown.com. There is also a First Class Ticket gold parallel. The image of Abe Lincoln is noted. Exclusive to retail Blaster boxes. Each player has several cards that correspond to the letters in their last name. 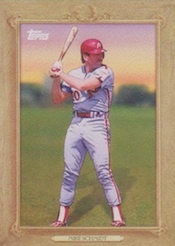 TOG-15 Ozzie Smith "Flips Out"
TOG-17 Wade Boggs: Who You Calling Chicken? Exclusive to Target "cereal" boxes. 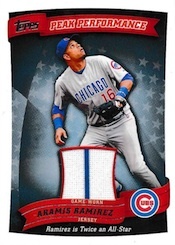 Good: Economical, variety of cool inserts, Topps Million Card Giveaway Promotion adds significant value. Bad: Mediocre design, very limited mid to high end content on a box to box basis. 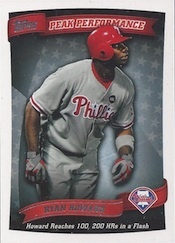 Bottom Line: 2009 Topps Baseball led the flagship Topps set into dangerous territory price wise, taking a low end product that has historically sold for $65 per box or less and bumping it up into the mid-end $80+ price range. 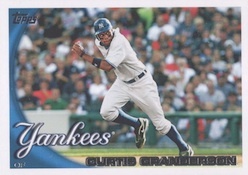 2010 Topps Series 1 corrects this misstep by delivering tons of quality content and value (albeit with less hit quality packed in) at a much more palatable price point. 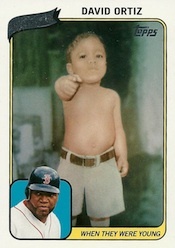 The design of this year's Topps set isn't horrible. It really isn't. But compared to some of the great designs and photography featured in past installments of the brand it is rather mediocre. 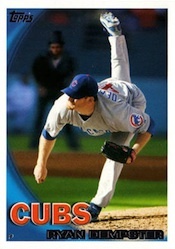 I would rank it as the second worst Topps base set design of the last decade, ahead of only the 2007 Topps set. It just has a bit to much of a campy, cartoonish feel to it that just doesn't do it for me. 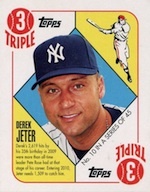 2010 Topps Baseball has a very solid checklist of active MLB vets and past MLB legends. The latter group is worked into the set by way of an assortment of different insert sets and short printed variations, both of which work quite well. 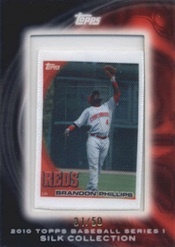 2010 Topps Series 1 is the best baseball card product released at this low a price point in quite some time. It is packed to the brim with inserts that are low in book value, yet compelling and fresh. Add in the fact that each hobby box yields 1 hit and roughly half a dozen Topps Million Card Giveaway redemptions and you're looking at considerable value for the price. I had a good time breaking this product, but it wasn't particularly exciting. I believe that set collectors will get the most out of it, just like in years past. 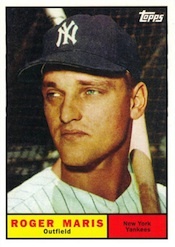 I would give this product a 4/5 because it has lasted the test of time and is THE baseball card product. 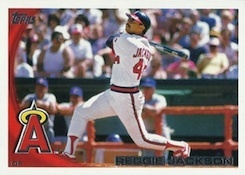 All of the rookie cards are true rokies and the Million Card Giveaway was a great addition.